Shamrocks is an original crochet pattern by June Gilbank. This is a clever little pattern to make sweet shamrocks with a dimensional 3D effect, in two sizes: a realistically-shaped design, and a tiny miniature version! 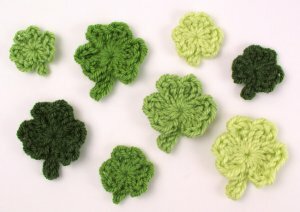 Each shamrock is crocheted in a single round, so you can make one in minutes. String them into a garland, attach one to a greetings card, add a pin back to make a cute brooch or lapel pin, or layer them for a novel look. Send me a donation and receive the easy-to-print PDF version of the pattern as a thank you! The PDF also includes a bonus: a stitch diagram for each shamrock design, in both right- and left-handed versions. Date Added: 03/14/2014 by Else T.
A quick, easy pattern to whip up a perfectly shaped shamrock!